Based in Los Angeles, ECMC Foundation is a national foundation working to improve postsecondary outcomes for students from underserved backgrounds. It is one of several affiliates under the ECMC Group enterprise based in Minneapolis, which together work to help students succeed. The Foundation makes investments in two focus areas: College Success and Career Readiness; and uses a spectrum of funding structures, including strategic grantmaking and program-related investments, to fund both nonprofit and for-profit ventures. College Success is focused on increasing the number of college students from historically underrepresented backgrounds, including low-income and first-generation populations, who pursue and attain bachelor's degrees. 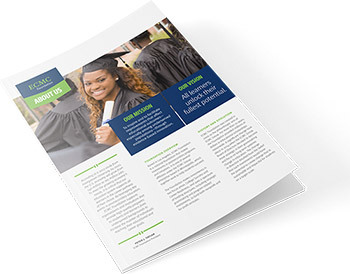 Learn more about the College Success portfolio. Career Readiness is committed to connecting adults with limited or no education beyond high school to career pathways that allow for economic mobility and a family-sustaining wage. Learn more about the Career Readiness portfolio. Long-Term Investments: We endeavor to make long-term investments—either alone or by leveraging the work of other nonprofit, public, private and philanthropic partners—that improve academic achievement among underserved students as they prepare themselves for postsecondary education and careers. Entrepreneurial: We take risks with our grantmaking dollars, understanding that failure is a natural part of generating discoveries; we will support innovation and a willingness to experiment with a bias toward ideas that can be scaled to benefit large numbers of students. Research and Reforms: We support important research and reforms that help people prepare for postsecondary success and careers. Measurement and Evaluation: We require measurement and evaluation in all that we do, and recognize our obligation to share the results of our work to help educate and improve the field, free of charge and available to all. 2000: The Beginning: ECMC Foundation was created as the charitable arm of ECMC Group. For more than 10 years, the Foundation provided millions of dollars in educational scholarships nationwide. 2014: Shift to Strategic Grantmaking: A significant change in direction took place when the ECMC Foundation Board of Directors decided to become more strategic in their grantmaking and hired President Peter J. Taylor to lead the organization. 2017: Focus on Postsecondary Education: Effective December 1, 2017, ECMC Foundation decided that it would focus its grantmaking in postsecondary education and no longer makes investments in the Teacher and Leader Development (TLD) focus area. The Foundation remained committed to honoring all existing TLD grants made by or before that date. Expansion of Investment Methods: ECMC Foundation began making program-related investments through Education Innovation Ventures (EIV) in January 2018. EIV provides flexible, risk capital to ventures with innovative and scalable solutions that increase educational outcomes and economic mobility among underserved students. Support of CTE Leadership: ECMC Foundation launched the CTE Leadership Collaborative in October 2018, an initiative focused on bringing together diverse perspectives and equipping CTE leaders with the tools, resources and skills needed to advance postsecondary CTE. $100 Million Dollars in Grants and Investments: At the end of 2018, ECMC Foundation met a remarkable benchmark: more than $100 million in grants and investments were made to more than 425 organizations across 45 states.